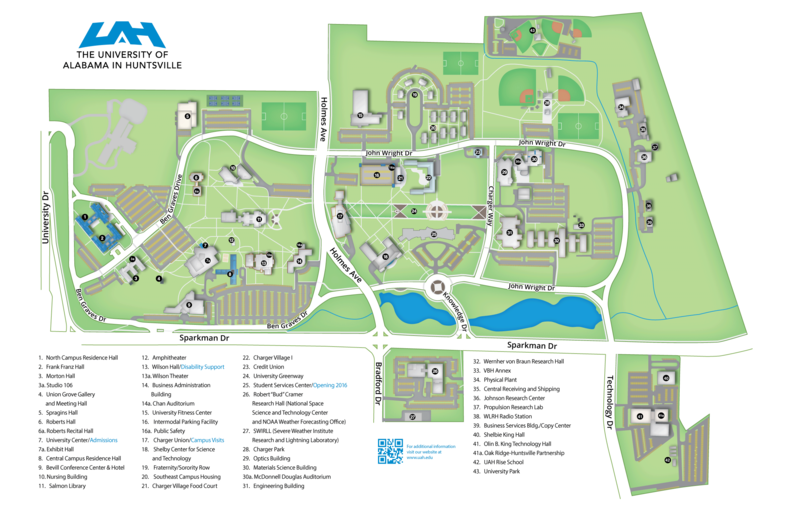 The OTC is on the UAH campus in Von Braun Research Hall, Suite E39. Take the Sparkman Exit and go north. Take the immediate first right turn onto Technology Drive, which will curve around by the lake and become John Wright Drive. After the curve, look immediately to your right. You’ll see the building name, Von Braun Research Hall, in big letters on the building. Turn into the parking lot. VBRH is a series of brick-shaped buildings connected by a long hallway. Go to the northernmost brick (nearest the Engineering Building) and take that entrance. Go through two sets of double doors and go left; we’re in E-39, and our name is on the door—Office of Technology Commercialization.